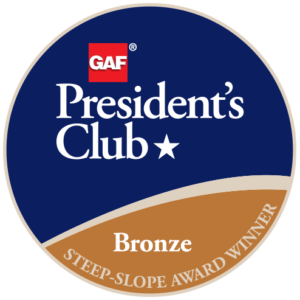 D&S Roofing of Deer Park, NY, has received GAF’s 2018 President’s Club Award. A GAF Master Elite(R) contractor, it has provided residential, commercial, industrial, and institutional roofing services to all of Long Island since 1939. Deer Park, NY – September 24, 2018: D&S Roofing Corp.
D&S Roofing Corp. of Deer Park, New York, has received the most prestigious contractor award GAF offers: The GAF President’s Club Award. This highly coveted award recognizes D&S Roofing as one of the “elite of the elite” residential roofing contractors in the United States. • Service pathway – where contractors consistently offer their customers the best protection available in the marketplace. D&S Roofing is a full-service contractor providing for the roofing needs of residential, commercial, industrial, institutional, and apartment-complex clients. With factory-certified mechanics and a full office staff to service client needs, the company uses only quality materials, providing the finest workmanship on every job from repair to installation. “At job sites,” says vice president Dominick Benvenuto, “we do all our own work. No subcontractors. And we use our own dump trucks, not dumpsters.” Highly reviewed on Angie’s List, the company is licensed, bonded, and certified. “We’re a staple in our local Deer Park community,” says Benvenuto, “and the owners are very involved with the local churches and schools. D&S Roofing also pays special attention to senior citizens and military and law-enforcement personnel.” A member of the National Roofing Contractors Association and the New York State Roofing Contractors Association, the company is a winner of GAF’s Triple Excellence Award (for consumer protection, installation, and training) and is accredited by the Better Business Bureau with an A+ rating. Family-owned for four generations, D&S Roofing has been providing roofing services since 1939. Serving all of Long Island, the company uses no subcontractors, accepts all major credit cards, and offers financing options.